An aerial shot of students building a 24-foot square wooden ramp, a stage landscape for dancer/choreographer Alice Sheppard and her collaborator, Laurel Lawson. Dancer and choreographer Alice Sheppard approached us with a dream design brief: a large-scale ramp for dancing on stage. She contacted Sara in fall 2015, asking to collaborate, and the project found a home in an Olin course—not the usual test kitchen, Investigating Normal, but in an introductory physics class with professor Yevgeniya Zastavker. The challenge was to house the operations of the inclined plane, or ramp, in an expressive physics—an exploration of its resistance, acceleration, and its affordances not for access, but for choreography. Alice came to campus in March for what we’re calling at Olin a “micro-residency”—suited to our scale (350 students total!). She gave an artist’s talk, and we audited the built environment of our campus to test its many ramped conditions for maximum speed, Alice’s preferred movements, banking, and so on. Alice gave an artist’s talk and performed on her first day on campus. As a class, we toured around campus with Alice, investigating her experience of its various exterior inclines. We made a provisional dance studio with floor tiles that our student dance club uses, and we borrowed mirrors from our colleagues over at Babson College’s theater group. 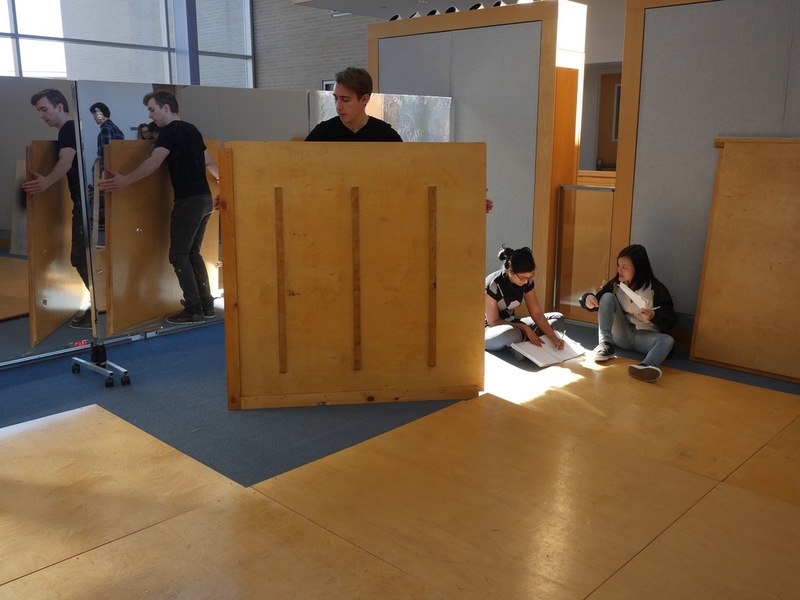 Students assemble the wood floor tiles in a modular pattern, with seven small ramps throughout. Students then spent time building out ramps—connected in modular, mutable fashion to the dance floor tiles—to test various heights and arrangements for Alice’s use. We also assembled my own ramps from the long-running Slope : Intercept exploration of the inclined plane. Alice played among these ramps, to test speed, turns, and choreography among the structures. A laser cut paper model of the final ramp structure. And when Alice came back in April, this time with her collaborator, Laurel Lawson, they danced on the real thing. It was the result of enormously steep learning curves—in CAD, in shop bot, in fabrication to the very end. You can read more about it in the Globe’s story here. Students new to fabrication skills like using a chop saw got a quick education! Other students got a big introduction to shopbot techniques. There were several late nights of putting together this behemoth. The massive landscape took up nearly a 24 foot square area. On their last day, Alice and Laurel performed short pieces for us on the ramp. This model will be built for performances in the next 12-18 months. And the work continues! Sara and Alice travel to South Korea for an exhibition and performance in Media City Seoul, and Alice and Laurel return in fall 2016 for further work in Investigating Normal. Follow the project also at Kinetic Light. Team: Alice Sheppard, Laurel Lawson, Yevgeniya Zastavker, Sara Hendren, Katie Butler, Daniel Daugherty, Duncan Hall, Andrew Holmes, Erica Lee, Scott Mackinlay, Apurva Raman, March Saper, Alexander Scott, Kimberly Winter, Jingyi Xu, Rachel Yang. Thanks to Jeff Goldenson, John Rosenwinkel, Russell Zacharias, and Mark Lorenzo.